At Monk Chat in Chiang Mai, the monks were much more interested in getting a photo of CAM than of BigB. It turns out that BigB just had to wait for his moment of glory: these monks in Labrang Monastery, China couldn’t get enough of his freckles and blue eyes. 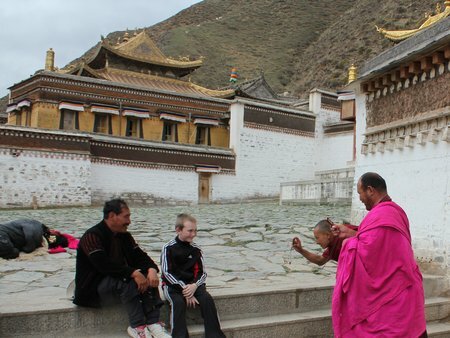 This entry was posted in China and tagged China, China With Kids, Labrang, Photo Friday, Xiahe on June 3, 2011 by wandermom. That is fantastic! We are all different and yet, we are all the same. When we visited Tibet the monks (and regular Tibetans too) were fascinated with Joel’s beard. At one monastery, a monk gave it a good scruffing while barking “ruff, ruff, ruff” at Joel…not sure what that was all about but it’s not every day your beard is given a good scritch by a monk!